What is the most important factor for success in international business? Will Africa Become The Next China? Oh, the romance of the frontier markets. Terrific unexploited business opportunities, rapid economic growth, low labor costs, daily brushes with danger, poor transportation and communications infrastructure , lack of basic amenities. Yet for those brave enough to come in early, these frontier markets offer phenomenal opportunities as they develop and transition to emerging markets. Just think of breathtaking growth of China, Russia, Poland, Chile, Brazil, Columbia to name a few. Now the big question is Africa. Unquestionably, the continent represents vast potential with emerging consumer class and superb natural resource base. Yet, poverty, disease, lack of energy and transportation infrastructure, political violence, corruption and lack educated labor force combine to stunt Africa’s development of the critically important manufacturing sector. So for those wishing to invest in the Africa’s story, they have to decide if Africa is the next China of manufacturing or simply a mirage and a story of unrealized potential. I feel that it will be a very uphill road for the African continent to develop any formidable manufacturing base over the foreseeable future. Granted, Africa is a quilt of many diverse countries and some countries, such as South Africa, may be more successful than others. However, given the current state of affairs, it will take decades until Africa can boast competitive manufacturing capabilities not only globally, but even to serve its domestic economies. However, there may be hope looming on the horizon. As illustrated in the article below, after several false starts during the ’80s and 90’s, a cadre of pioneering entrepreneurs is outpacing large multinationals and setting up innovative small manufacturing facilities capable of competing in the global arena. As they are doing this they are experiencing many adventures, which are common to those who pioneer frontier markets. These adventures make for interesting human interest stories. They also illustrate serious business issues, which will serve well anyone who wish to take their business into the foreign markets and to stay competitive as our world continues to develop as a global marketplace. As always, I hope you enjoy the article below and welcome your comments. By PETER WONACOTT, The Wall Street Journal, September 25th, 2011. ANKETRAKABE, Madagascar—After a bumpy two-hour truck ride and a river crossing by canoe, Tim McCollum reached this village set beside a canopy of cacao trees, the first link in a supply chain that would help boost production at his small African chocolate factory. The good news was that Mr. McCollum’s Madécasse Chocolate LLC. had located a rare source of premium cocoa before another competitor. That was also the bad news. Mr. McCollum learned villagers had zero experience dealing with global customers—one 71-year-old told him he was the first white man he’d seen here since Madagascar gained independence from the French in 1960. Then there was the river. Nobody on his team was sure how to move a ton of cocoa across it in a canoe. But after meeting with the local farming cooperative, Mr. McCollum became convinced that cocoa grown here could make the 600-mile journey to his factory and be shipped to U.S. supermarkets from Madagascar, an island off Africa’s southeast coast. Peter Wonacott/The Wall Street Journal Though wages aren’t high, the chocolate factory offers steady employment in Madagascar’s struggling economy. Across Africa, scores of tiny manufacturers have been going where most multinationals fear to tread. They not only make chocolate in Madagascar, but also leather shoes in Nigeria and hot sauce in South Africa. They’re testing whether a continent with the highest share of unexploited resources in the world, and the lowest per-capita income, can be fertile terrain for industry. Madecasse, the Brooklyn-based gourmet food company, is going to great lengths to find sources of premium cocoa. 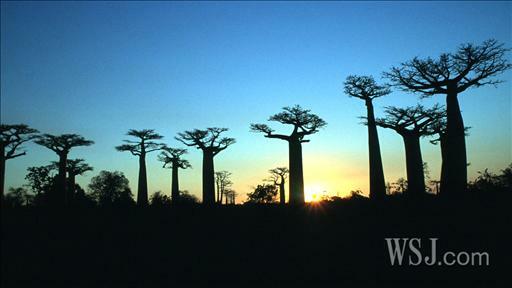 WSJ’s Peter Wonacott reports from Madagascar. “For decades, Africans have produced what they do not consume and consumed what they do not produce,” says Andrew Rugasira, a Ugandan entrepreneur. Two years ago, his company, Good African Coffee, broke ranks with local bean exporters to open the country’s first instant-coffee plant. Why Africa doesn’t make more stuff has been an enduring mystery of the global economy. As wages rose in manufacturing powerhouses such as China, many economists predicted that factories would flock to cheaper pools of labor in Africa, helping to spur the same sort of rapid industrial growth that lifted living standards across Asia. It hasn’t happened. Africa’s economy has averaged solid 5% annual growth over the past decade, thanks to rising commodity prices and new consumer demand. 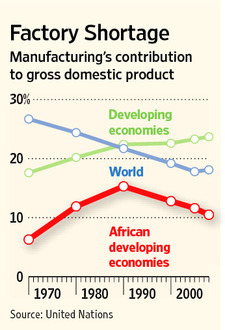 The continent, however, accounts for just 1% of global manufacturing, compared with Asia’s 25%. Africa’s share of labor-intensive manufacturing—a vital source of jobs for underemployed farmers—is actually shrinking, according to a July United Nations report. The situation so alarmed the World Bank that it began talks with Chinese trade officials on how to move more factories to Africa from China, according to World Bank President Robert Zoellick. The bank estimates there are now 85 million manufacturing jobs suited for unskilled workers in China, out of a population of 1.3 billion, but only 10 million in all of Africa, population 1 billion. Western multinational manufacturers mostly have shied from the continent even as they have plunged into other developing countries. A report by UBS Investment Research concluded that China’s share of low-end manufacturing exports—including toys, clothes and shoes—has peaked, but production was moving to other low-cost countries in Asia, such as Vietnam and Bangladesh. Africa is regarded as a riskier destination. Many countries are plagued by corruption. There have been repeated clashes between ethnic groups. And this year’s civil conflict in the Ivory Coast demonstrated once again how power struggles can damage promising economies. And yet, executives on the ground note improvements in local governance and say Africa is becoming more conducive to private investment. Rwanda lost nearly a million lives in a 1994 genocidal conflict, but it is now among east Africa’s fastest-growing economies. Those Western multinationals that are expanding in Africa are doing so mainly to reach an emerging class of consumers. The South African unit of Nestle SA is spending about $56 million to expand production of instant noodles and cereals such as Cheerios. The Swiss conglomerate is also opening an instant noodle factory in the Democratic Republic of the Congo, one of Africa’s poorest countries. Before Nestle invests in a new African country, it sizes up access to water and electricity. Rival Kraft Foods Inc., the U.S. snacks giant, earns about $1 billion in annual sales from Africa, where it also manufactures. But it must contend with the continent’s constraints. Chief among them: an acute shortage of skilled labor that forces Kraft to rely on expatriates. “If you want to pull off large-scale manufacturing projects you bring in expats, which drives up costs,” says Johan van Zyl, manufacturing director in Johannesburg for Sub-Saharan Africa. 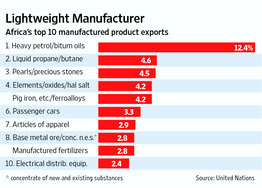 Smaller manufacturers can’t match the production muscle of a multinational. But they are usually quicker to spot opportunities and gutsier in pursuit of them, according to Mark Paper, chief operating officer of Business Partners International, a South African financial institution specializing in lending and investing in smaller companies. One of the companies Business Partners is backing is Primolitos, a South African supplier of hot sauces and condiments that in May opened a glistening new factory in Johannesburg. It hasn’t been smooth sailing. During an unrelated metal workers strike, a brick came through the company’s conference-room window. Trucks transporting its condiments have been hijacked. But Primolitos is now among the few local food manufacturers that can meet standards for global customers. 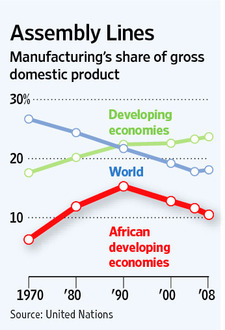 Not many African manufacturers are so ready for the global economy. Mthuli Ncube, chief economist at the African Development Bank Group, estimates that one-quarter of Africa’s gross domestic product—about $450 billion—comes from 65 million small and medium-sized enterprises. But the contribution from manufacturers is tougher to measure; many are tiny cottage factories that sell goods in open-air bazaars to avoid paying tax. Africa’s industry isn’t so different from the modest roots of China’s own industrial revolution. In the 1980s, Chinese farmers invested in factories to make goods for rural consumers. Multinationals arrived later to fuel an export boom, according to Zhang Chunlin, an economist at the World Bank in Pretoria who specializes on private-sector development. Tim McCollum’s company, Madécasse Chocolate, sought to exploit a paradox. Africa produces 60% to 70% of the world’s cacao, but most of the chocolate is made outside the continent. Mr. McCollum and his partner Brett Beach, who had served together as Peace Corps volunteers in Madagascar, thought they could create jobs and alleviate poverty by making chocolate there. “If Africa could sell the world chocolate…it wouldn’t solve all the continent’s problems, but it could make a big dent,” said Mr. McCollum. In August, Mr. McCollum arrived in Madagascar to smooth out production issues. Not least of the problems was that Madécasse’s lead taste tester, factory owner Mr. Cassam Chenai, had developed an allergy to chocolate. Madécasse had been rushing to develop a new bar made from Madagascar coffee and another with cinnamon and hot pepper ahead of a late-September food show in South Africa, but Mr. Cassam Chenai, who is of Indian descent and grew up here, said he could taste very little of it because he would break out in a skin rash. “That’s why product development is taking so long” said Mr. McCollum. 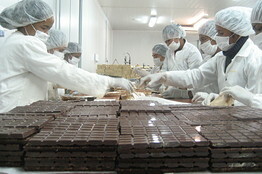 The company also needed to secure new sources of cacao to ramp up production. He received leads from his employees who worked with the region’s farmers. Madagascar produces less than 1% of the world’s cacao, but a significant portion is of high quality. Mr. McCollum learned that tests around Anketrakabe village area suggested an unusually high 10% of the cacao there could be the premium variety known as Criollo, the most expensive on the market. Madécasse wasn’t able to alert Anketrakabe residents about its visit because, it turned out, the closest cell-phone signal was about three miles away on top of a hill. Even so, the head of the local farming cooperative, George Jaomiarana, was glad to see Mr. McCollum. Villagers believed they could get better prices dealing with foreign customers, rather than local middlemen who took cuts on cacao sales before passing onto exporters. Speaking in French and the national Malagasy language, Mr. McCollum held out the prospect of investing in new storage and fermentation facilities for cacao beans and training farmers how to use them properly. He peered into one storage bin to see wasps and spiders crawling among the beans. “Gross,” he said in English. But examining the cacao trees just beyond the village, Mr. McCollum grew upbeat about what he saw. Huge blood-red pods loaded with beans drooped from branches. He took out his pocket knife to cut leaves for more genetic tests. After returning to Brooklyn, Mr. McCollum pledged to buy one ton of cacao per month from the farmers starting as early as next month. If things went well, Madécasse would purchase two tons a month—in dollar terms about triple what the cooperative is selling now. At some point, Mr. McCollum ventured, they would talk about building a bridge across that river. “We’ll canoe it for a while,” he said. —Nicholas Bariyo in Kampala, Uganda, and Devon Maylie in Johannesburg contributed to this article. After a brief summer hiatus, we are resuming our weekly postings. This week’s article deals with a very interesting strategic issue of western companies entering a promising foreign market, only to find themselves later outsmarted and outcompeted by the local upstarts who have not only adopted their technologies and production techniques, but are also able to better compete and steal massive market share both home and abroad. This is a perennial problem (remember Japanese cars and electronics couple of decades back? ), which also has broad strategic implications for western companies with high labor costs. There are two ways to deal with this problem: Western companies must foresee such a scenario and be ready to cede the market over the long-term once its commoditized. They need to focus on R & D and stay ahead of the curve by innovating, discovering new niches and attractive market segments, where a premium is placed on engineering, research, customer service, branding and top quality manufacturing. Apple and Motorola Solutions are great examples of such strategy. Apple uses Chinese manufacturing to assemble its products, but owns the customer experience, brand, design, research and development thus making it one of the most successful companies in history. Motorola Solutions also is very adept at staying on top of developing markets and technologies. It focuses on developing state-of-the-art products to solve complex problems in the fields of global healthcare, shipping and logistics, and public safety, all while divesting its mature and commoditized segments such as its Wi-Fi networks business. Another way for Western companies to protect from domestic competitors abroad is to remain competitive in their manufacturing processes, reduce labor costs and vastly improve productivity. This means introducing robotics into manufacturing operations and reducing human labor costs. Both of these techniques, I would imagine, will not be popular with organized labor . Yet, union leaders must take a long hard look at the current competitive situation of the western companies and realize the dire predicament of such an inherent cost disadvantage. By refusing to adopt to the global market pricing (we do not necessarily need to match the labor costs offered by low cost emerging markets, but bridging the gap will help immensely), unions risk long-term erosion in favor of the temporary bliss and comfort of the labor force who are clinging to the mirage of the current high wages and generous benefits. It is a strategy that is doomed for failure. We have already witnessed the downfall of the U.S. garment industry, as well as TV manufacturing and furniture industries. Thus unless western companies understand the broad strategic implications of the global balance shift towards the emerging dominance of leading emerging markets, they are doomed to be relegated to the status of also rans, and that would be a tragic outcome. I hope you enjoy the article below and as always welcome your comments and suggestions. In the elite segments of China’s markets, western companies are threatened in terms of market share, sustained impressive growth rates and profit margins. By George F. Brown, Jr. and David G. Hartman, Blue Canyon Partners, Inc.
Over the past decade, many western firms have identified and targeted China’s exciting, fast-growing markets. Most of these firms had already established manufacturing and sourcing operations in China, lured there by the low labor cost environment and its potential for delivering significant cost savings. Soon, a network of western firms emerged, with many traditional supplier-customer relationships transported into China. Over time, those firms turned their attention to selling to Chinese businesses and consumers, joined by other first-time participants in that country’s markets. Many of the western companies that established a presence in China were among the “early birds” of western markets, leaders in technology and design, with product offerings far beyond anything previously available to China’s customers.Most of these companies found success in China. From a base of nearly zero, China became their company’s “growth story,” expanding year-after-year at significant double digit rates and within a short time achieving enough scale to move the needle in terms of both the top and bottom lines of their income statements. “Our continuing success in China was a major factor driving the past quarter’s results” remains a common statement in the earnings releases of many western companies. The customers reached by these western firms with their leading-edge products were the elite of China, a combination of western firms operating there that needed ingredients for their export-oriented manufacturing and the highest-end of China’s own society. Western firms operating in China carried their standards and expectations with them, as for the most part, their operations in China were oriented towards production to serve western customers. They expected their suppliers in China to be no different than their suppliers in developed country markets — and in fact in many instances, these suppliers were the exact same firms. The elite consumers in China quickly gained awareness of the best that western firms had to offer, and had the income levels necessary to buy those products. And for these elite Chinese consumers, buying products that represented the best that the west had to offer was a statement of their stature in a country where that matters considerably. The number of these elite customers grew very rapidly, from a miniscule fraction of the population, to a tiny fraction of the population, to a usually-still-small fraction of the population today. As the bell-shaped income curve shifted to the right at China’s growth rate, with its 1.3 billion people, even small shifts generated huge numbers of consumers at the higher-income levels. For the western firms, doing business in China was thus a natural extension of their activities elsewhere, as customers were either familiar western firms or elite Chinese with preferences much like those of western consumers. As western firms enjoyed the growth described above over the past couple of decades, a new group of Chinese firms emerged, many from the state-run or local enterprises of prior years. These firms had access to the lowest cost labor pools that were available throughout China, and in fact practiced “China economics” in a way that enabled them to achieve price points almost unimaginable to western firms. Many of these Chinese firms sold to their own customers at prices that were dismissed by western companies as either the result of government subsidies or a cultural belief that they could “lose money on every unit, but make it up on volume”. Their products lacked the sophistication and refinement of the western brands, often characterized as low-quality knock-offs of similar products manufactured by western companies. In many instances, these Chinese firms also developed solid manufacturing competencies, and began to be “hired” on some basis by western firms to make products for them, creating a cycle in which they strengthened their manufacturing skills under the tutelage of the western firms for which they were working. Furthermore, through these relationships, they were also exposed to western technology and design on an ongoing basis. Haier, for example, got its start manufacturing refrigerators for Germany’s Liebherr Group (and eventually borrowed its present name from the ‘herr’ portion of that firm’s name in Chinese). In other instances, western firms were delighted to license technology and design to Chinese startups, often that of past-generation products. Geely entered the automotive industry in such a manner, with its first car based upon the design of the Daihatsu Charade seen all over Asia with local brand names. Most western firms dismissed these new Chinese firms as in any way representing a threat to their business. Their products, especially in the early years, were viewed as primitive and often laughable, only interesting to the low-income Chinese that couldn’t in any way afford the quality embedded in western products. And such western companies comforted themselves with the knowledge that those Chinese consumers who had risen in the income distribution were clearly signaling their preference for the offerings of western firms, even though these low-cost imitations were widely available. In terms of western markets, it was widely believed that it would be many generations before a Chinese firm could meet the standards, regulations, and expectations of western consumers. And furthermore, in many industries, it was argued that even the primitive offerings of these Chinese firms were the product of stolen western intellectual property, a practice that might work in China, but which couldn’t be exported elsewhere. The emergence of the Chinese firms described above poses two significant challenges to western firms. The first of the challenges involves the new face of the global competitive environment. In an article onIndustryWeek, we have written about the emerging wave of Chinese competitors that are not only being successful in China’s broad middle market, but also gaining stature around the globe. We have labeled the emerging global competitors from China as Second Mouse firms, drawing upon the saying “The early bird gets the worm, but the second mouse gets the cheese” and reflecting the fast-learner and fast-follower capabilities of these firms. There are many such Second Mouse firms around — Huawei in telecommunications equipment, Haier in appliances, Sany in construction equipment, Mindray in medical equipment, Geely in autos, among many other examples. All of these firms got their start in China, learning from western firms, showcasing strong manufacturing and economic competencies, and establishing a strong position serving those Chinese consumers below the points on the income distribution where western products were an option. Our characterization of these companies as Second Mouse firms doesn’t just reflect their ability to learn from and follow the leaders from the west. They were also genuinely second in the race, faster than the many other Chinese contenders who started up at the same time and with the same roots. They grew to significant scale in China’s markets, and evolved from their early position as contract manufacturers to become legitimate firms. But for many years, their focus remained centered on the middle markets of China, and over time they evolved products that were “almost as good at an incredible price point,” a considerable improvement over the early knock-offs belittled by the western firms in their industries. In part, their ability to achieve nearly-comparable products was due to their mastery of “China economics,” but a significant factor reflected important elements of China’s business culture, including an ability to think far outside of the box, processes that allowed progress at “China speed,” insights about what actually mattered to customers in their target market and a willingness to engineer unnecessary features out of the product and out of the cost structure, and service competencies that redefined relationships with customers and allowed the substitution of low-cost labor for high-cost product elements and business processes. These Second Mouse firms are no longer constrained to China’s markets. As the examples cited above suggest, they are now significant global players. Some, like Huawei and Haier, are among the leaders in their industries, having surpassed well-established western firms in terms of sales and global market share. 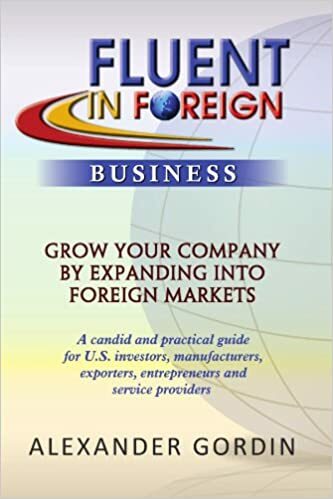 The transition of these firms into global markets has been gradual, with most of them first venturing into other developing markets in Asia, then into developing markets elsewhere, and only recently into the developed country markets of North America, Europe, and Japan. In many industries, these Second Mouse firms haven’t yet arrived in the developed markets of the west, allowing western firms to continue to embrace the fiction that they aren’t serious global competitors. But it is more likely just a matter of time until they arrive and become the most serious competitors of the coming decade. Western firms face a second challenge, one that reflects the difficulty they will face in terms of getting to the point where they can compete with Second Mouse competitors. What western firms didn’t recognize was that in their strategy for entering into China’s markets, they fell into the “first mouse trap.” By entering the high-end of China’s markets and prospering there, these western technology and design leaders, with their advanced products and high price points, had created a conundrum for themselves. To later enter the broad middle market, where almost-as-good products at very attractive prices are prerequisite to success, they would have to take actions that would threaten their income and profit streams from the elite market segments and from their China operations oriented towards serving western customers. And doing so would disrupt the steady growth expected from these firms’ China operations. Since the elite segments of the China market were initially the fastest growing parts of the market (in percentage terms), growth rates in sales were impressive indeed. Naturally, most of these western firms remain focused on the elite segments of China’s markets, earning solid margins and continuing to grow at reasonable rates, but without an ability to expand into the broad middle markets of China without compromising their position — and their profits — in China’s elite market segments. As a result, the broad middle markets of China remain the territory of the Chinese Second Mouse firms. Fortunately for the Second Mouse firms and unfortunately for their western competitors, those markets are where most of the growth of the next decade will be found. It will be hard for any firm to be among the global market leaders in 2020 unless they have a meaningful share of the broad middle markets of China (and India, Brazil, etc.). Ceding these markets to the Second Mouse firms not only most likely hands over global leadership to them, but also enhances their abilities of the Second Mouse firms to compete in the west, both as a result of the earnings from emerging markets and from their continued access to the world’s best laboratory from which to evolve products that can compete and win around the globe. Evidence of this is already plentiful, as a quick reading of press releases describing Second Mouse investments and acquisitions in the west will verify. And even in the elite segments of China’s markets, the future will begin to threaten the western companies in terms of market share and sustained impressive growth rates and profit margins. As China’s income distribution continues to shift, the new entrants into the elite segment will face a choice between western brands and those “almost as good products at a great price point” from the Second Mouse companies, an option much different from the earlier choice between western brands and laughable knock-offs. The strategic implications of these two challenges are clear. Future growth will require western companies to develop the ability to compete in the broad middle segments of emerging markets like China. And future competitive success in even traditional western markets will require responses to new Second Mouse competitors that will quickly offer western customers “almost as good” products at highly attractive price points — a value proposition likely to find as many takers in the west as it did in China and other developing country markets. Those that are skeptical of this should reflect on western firms like Southwest Airlines and Vizio that generated great success using what is basically a Second Mouse business model. For most firms in most industries, while this challenge is on the way, there is still time to shape a response to these challenges. We believe that an effective response will require western businesses to evolve, blending what they already do well with the competencies that characterize Chinese Second Mouse firms. It will no longer be enough to be an “early bird” leading the way with innovative technology and design. The growth markets of the future will place a much more significant premium on price, with the competitive winners far more likely to be those with “almost-as-good products at a great price point” than those with state-of-the-art technology. This prescription is very different from the mantra that most western companies have repeated over the years: “We must step up our innovation capabilities in order to maintain our lead on the Chinese competitors.” The global leaders of the future will have to figure out how to blend both competencies, sustaining leadership over the full technology life cycle. To accomplish that, most western firms will have to bring what the Chinese do so well into their own firm’s cultures, most likely through acquisition of companies from developing markets like China. Doing so will require a different perspective on acquisition strategy and about what is to be accomplished in the integration process. Acquisition priorities must be refocused on strong Second Mouse companies, and integration priorities must emphasize not just retaining, but fully assimilating, the core competencies that these acquired firms can bring to the firm that acquires them. The task ahead is monumental, but it is one that must be tackled by western firms aspiring to sustained global leadership. George F. Brown, Jr. is CEO of Blue Canyon Partners, Inc., a strategy consulting firm. David G. Hartman is Blue Canyon Partners’ China Practice Director and has been an active participant in China’s markets for over twenty years. He has previously served on the faculty of Harvard University and as executive director of the National Bureau of Economic Research. WASHINGTON, DC – Agriculture Secretary Tom Vilsack and United States Trade Representative Ron Kirk today announced the appointment of 148 private-sector members to the Agricultural Policy Advisory Committee (APAC) and six Agricultural Technical Advisory Committees (ATACs). Congress established the advisory committee system in 1974 to ensure a private-sector voice in establishing U.S. agricultural trade policy objectives to reflect U.S. commercial and economic interests. The U.S. Department of Agriculture and the Office of the U.S. Trade Representative jointly manage the committees. The APAC provides advice and information to the Secretary of Agriculture and the U.S. Trade Representative on negotiating objectives, positions and other matters related to the development, implementation and administration of U.S. agricultural trade policy. The ATACs offer technical advice and information on specific commodities. Lists of appointed members by committee can be found here. “Let me begin today by expressing the appreciation of the United States to members of the Cairns Group, and especially to Ministers Ritz and Emerson, for the invitation to participate in this ministerial meeting. Ambassador Kirk regrets very much that the press of important business with the U.S. Congress prevented him from joining you, and he has asked me to convey his personal appreciation for your invitation to Ambassador Siddiqui and me to stand in his place. “We have learned through the years that our engagements with the Cairns Group consistently enrich our own consideration and development of U.S. trade policy. This is grounded in our shared commitment to the WTO. The WTO continues to prove its vitality as guardian of the rules for international trade, and also as a unique and effective forum for dispute resolution. Throughout the ten years of difficult Doha negotiations and global economic crises, the transparent, predictable and rules-based multilateral trading system embodied by the WTO has served as an effective bulwark against protectionism and has provided its Members with an essential source of sustainable economic growth, development, and job creation. That’s the good news – and we shouldn’t allow it to be overlooked. But nor should we sugarcoat the Doha Round’s current problems. “We have found that the Cairns group is a good group for brainstorming. And the need for brainstorming is particularly critical right now, as we face a highly uncertain, but undoubtedly difficult, road ahead on the Doha Development Agenda. “Like all of us here, the United States has serious concerns about the overall state of the Round, including the significant challenges confronting WTO Members as we prepare for the 8th Ministerial Conference of the WTO in just three months’ time. “When they meet in December, ministers will confront a variety of different perspectives on the Round, its prospects, and its forward path. And there is a distressingly short period of time to figure out, collectively, what to do. WASHINGTON, D.C. – Today United States Trade Representative Ron Kirk announced that the World Trade Organization (WTO) Appellate Body found in favor of the United States in a dispute brought by China challenging the imposition of additional duties on imports of Chinese tires. A WTO panel had rejected all of China’s claims against the United States, finding that the United States acted consistently with its WTO obligations in imposing the additional duties. The Appellate Body, in turn, rejected all of China’s claims on appeal. China alleged that the USITC’s determination regarding market disruption and the level and duration of the additional duties were inconsistent with the Protocol of Accession and the GATT 1994. In addition, China alleged that the section 421 definition of “significant cause” was in and of itself inconsistent with the Protocol of Accession. A WTO panel sided with the United States and rejected all of China’s claims in a report circulated in December 2010. China appealed with respect to the panel’s findings regarding the USITC determination. The Appellate Body’s report can be found here. WASHINGTON, D.C. – The Office of the United States Trade Representative issued the following statement today regarding the planned Trans-Pacific Partnership negotiations in Chicago, IL this week. On Thursday, September 8 President Obama unveiled the American Jobs Act to the public. Part of the President’s strategy to rebuild the economy, the legislation is a set of ideas supported by both Democrats and Republicans that will help to put Americans back to work without adding anything to the deficit. It will help workers find jobs through investment projects, tax cuts for workers and for businesses, support for the long-term unemployed and more. The American Jobs Act will make a real difference for real Americans who want to support their families, send their kids to school and save for retirement. The jobs it helps to create will be jobs in your community, for teachers laid off from state budget cuts, veterans returning from Iraq and Afghanistan, first responders, and construction workers who can help to rebuild our roads and bridges and schools. And it does more for those who have been unemployed for a long time, helping them support their families while they look for work and reforming the system to better connect them to real jobs. Through the American Jobs Act, President Obama is rebuilding the economy the American way: based on balance, fairness and the same set of rules for everyone. It will create the jobs of the future by investing in small business entrepreneurs, education, and making things the world buys – something we know about at USTR, and why we’re also working for the passage of job-creating trade agreements with South Korea, Colombia, and Panama. The President will send the American Jobs Act to the Hill next week. Congress must act immediately to create more jobs and put more money in Americans’ pockets right now. Naturipe Farms is one of a number of U.S. agricultural businesses entering the global market and seizing opportunities to export American-grown food. Naturipe Farms is a joint venture created by Michigan Blueberry Growers Marketing (MBG), Horifrut SA Naturipe Berry Growers (NBG) and Munger Farms. They saw an opportunity to form a partnership under a common brand and approaching the marketplace under a unified “One Voice” theme. By joining together the growers are able to provide smooth transitions of the multiple harvest seasons across the U.S and provide a consistent supply of berries to clients and consumers in the US and around the globe. Naturipe includes hundreds of berry farms in states across the country from Florida to Michigan to New Jersey and California to Washington. Berry farmers rely on Naturipe to market and export their strawberries, raspberries, cranberries, and blackberries to consumers, retailers and restaurants around the world. These farmers are working together to provide a consistent supply of fresh berries all year round by strategically streamlining their distribution of fresh berries to customers. Teamwork has allowed these individual agricultural businesses to gain a competitive advantage by delivering what retailers and other customers want. This includes consistency in food safety standards, packaging, delivery, better products at competitive prices, and most importantly, a reliable supply of fresh berries throughout the year without pause. USTR is working hard to open market access for farmers like Naturipe’s berry growers. The quality of U.S.-grown products has repeatedly proven to win over new customers overseas, and USTR wants to help lower tariffs and other trade barriers so that U.S. products can compete fairly in international markets. That’s why the Obama Administration is emphasizing the importance of export opportunities in our trade agreements to growing the economy.